From the author of the best-selling Mafia exposé, Wiseguy, comes this inside story of the billion-dollar gambling industry and the secretive, dangerous men who run it. 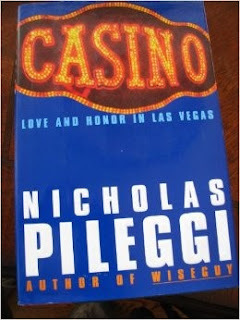 At the heart of this true tale of love, revenge, and murder Mafia-style are some of the most memorable characters in mob lore: Lefty, the brains of the mob's Vegas casinos; Tony Spilotro, the mob's muscle; and Geri, Lefty's adulterous show-girl wife. Casino: Love and Honor in Las Vegas is a morality tale among two thieves who tried to begin a new life in Sin City. Everything was fine until betrayal came along and stirred quite an act that affected everyone around both men. One of the men was the brains, while the other was the brawns – a two-man act necessary to cripple the betting world of Las Vegas. The brains was called Frank “Lefty” Rosenthal, a shrewd sports handicapper who had a genius for controlling the odds in any kind of sports game, even if it meant bribing a sports team’s upper management. Rosenthal is one of the gods of Las Vegas’ sportsbooks, which was sought-after by the criminally-minded elites who watched and wagered on almost any sporting event in America. The muscle was Anthony “The Ant” Spilotro, a longtime confidant of Lefty whose job was to rule with an iron fist and keep watch on the mob’s gambling interests. He is regularly informed by local insurance brokers of the whereabouts of the best jewels, making him a very important asset for anyone who wants to steal anything. The story is a riveting look at the dark alleys of the gaming industry’s insider games during the mob’s rule of Las Vegas. Several years ago, Las Vegas wasn't all about "world-class luxury and elegance" and "breezy and beautiful," as information portal Mayfair Casinos claims with the city's establishments. The book provides a blow-by-blow account on how organized crime stole from the casinos as it controlled every form of wagering from the shadows. The book shows how fixings were being done by the persona of Lefty, whose handicapping talents made him a non-violent, yet extremely dangerous, villain during the years when he is most active. Everything started to go wrong when Lefty married a beautiful, but emotionally-unstable, showgirl, who eventually commits a terrible crime against her husband: sleep with The Ant. It was civil war when her act of betrayal was discovered by Lefty. The brains eventually ratted the brawns out, and everyone who enjoyed benefits, down to the smallest fry, from Lefty’s fixings got involved. Love and Honor in Las Vegas is a cautionary tale of what respect means in the world of crooks. It is a nice read for those who want to get a glimpse of the mob’s rule in Las Vegas. Thanks for this blog post. Actually i'm really looking forward to catch-up the best books to improve my skills in the fields of online casino gaming.